iLive has announced the formation of its Studio Series business line, designed to fill the growing need for high-end iPod accessories and peripherals. The Studio Series includes the iHT8817DT DVD Home Theater System with 5.1 surround sound, an on-board slot-loading HDMI DVD player and a motorized iPod docking drawer. This fully self-contained home theater system will be available in October and features the first ever SRS HD4 for home theater and plays audio with True 3D sound enhancement and SRS TruBass. The Home Theater Solution includes AM/FM radio, powered iPod dock and audio/video inputs. The speaker was designed as a partner for flat panel TVs to create an elegant, simple, complete home theater system. The Studio Series iHT3817DT Flat Panel Bar Speaker, with a motorized iPod docking drawer and AM/FM Radio, is shipping and consists of two self-contained high-performance, high-power speaker enclosures featuring True 3D sound, SRS acoustical enhancement and 2.1 speaker systems with a built-in subwoofer. The system has audio and video switching and is designed to sit on a counter or, for maximum style impact, mounted underneath a flat panel TV on the wall (wall mounting bracket included). The iHT3807DT from the Studio Series is an innovative and upscale home speaker system with a retractable iPod-certified connection, and an AM/FM radio with preset functionality. The beautiful unit also available now, is built for sound and consists of two, self-contained, high-performance, high-power speaker enclosures and a ported subwoofer featuring Enhanced 3D audio, SRS‚Ñ¢ TruBass enhancement. The unit also features high-power amplification, a stereo auxiliary input, AV outputs for connecting to an external AV system, and a USB connection for iTunes sync. Also, available now from the Studio Series is the clock radio model ICR6807DT. The arch-shaped unit with its iPod dock located on top, has digital tune AM/FM radio with 10 presets. Four built-in and acoustically calibrated stereo speakers provide high-performance True 3D sound reproduction with 4 EQ presets while the dual alarm feature allows wake or gradual wake settings to iPod, radio or buzzer. 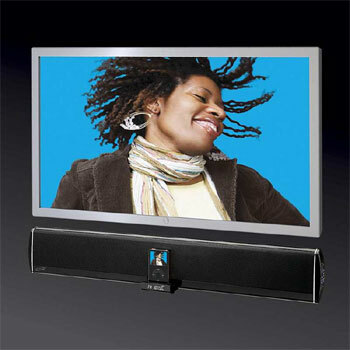 With video output, the unit plays back videos and photos from the iPod on any TV with a composite input. The unit includes automatic time setting and 7-Channel Weather Band Radio. The line will continue to grow with new additions coming later in the year. The Studio Series is also adding an iPhone speaker solution with state-of-the-art speaker drivers, electronics and design.